OPRI is interested in the development of unique polymers for applications within and beyond the contact lens marketplace. We understand the importance of developing products that meet the needs of clinicians and custom contact lens manufacturers worldwide. By partnering with customer labs, academia, and key opinion leaders the collaboration will serve to combine their expertise to bring new products to market that will further benefit patients. With its nearly 60 years of culmulative experience creating polymers for the optical industry, the OPRI team contributed to many advancements in several key areas. The use of fluorine in the OPRI chemistry has been instrumental in the successful and unique polymerization of oxygen permeable materials, producing exceptional products that are unmatched within the contact lens industry. OPRI also continues to collaborate with a number of governmental, educational, corporate and privately-held organizations to develop new polymer advancements for a variety of distinctive industrial applications. OPRI has an exceptional ability to “think outside the box”, providing companies with an assortment of scientific approaches in the development of new products designed to meet the needs of a rapidly changing technological environment. Before joining OPRI, one of its principals lobbied The United States Congress to approve the industries inclusion in the “FOR THE BETTERMENT OF MANKIND” project for NASA’s Commercialization of Space Program to study the polymerization of polymers in the weightlessness of space. 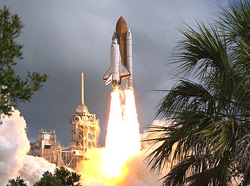 Free from the effects of gravity, it was hypothesized the microgravity experiments would lead to a process that could improve the purity of the premium-performance components necessary for making contact lens polymers. OPRI will be introducing AQUA->PERM SiOHTM, a NEW Silicon-Hydrogel polymer for custom lens manufactures to market internationally very soon. AQUA->PERM SiOHTM is a new single-point diamond turning (SPDT) lathe cut polymer utilizing the latest polymer technology deriving unique surface qualities, combining the benefits of HEMA (soft) and GP polymers to provide outstanding levels of on eye comfort and a high level of Dk that promotes corneal health. Visit us again as further information will follow. OPRI believes that further advances may be possible with surface modification techniques. Using different high energy plasma methods to dramatically alter the surfaces of lenses that may yield polymers of even greater long-term wettabilty and comfort – including polymers that have previously been discounted due to their hydrophobic nature. As a result, this development may open a whole new variety of previously unusable highly permeable polymers for use in contact lenses. Plasma is a partially or completely ionized gas with roughly equal amounts of positively and negatively charged particles. There are two types of plasma: high and low temperature. 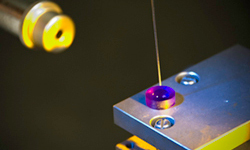 Low temperature plasma is the technique used for polymer surface modification. 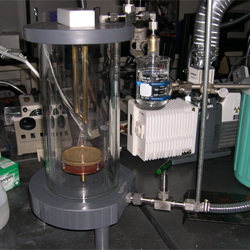 The most common method used today is plasma oxidation. In this method a lens is exposed to a plasma generated by high energy RF, at a low vacuum in the presence of oxygen gas. Under these conditions, oxygen reacts chemically with the surface producing oxygen-containing structures on the surface. Spectral analysis shows the presence of hydroxyl (OH) and carbonyl (C=O) groups in addition to other decomposition products and unstable species. This treatment instantly improves the wettability of the surface; however the effect is not permanent. A second method is plasma spattering. This involves graft polymerization using the plasma energy to bind a hydrophilic monomer to the surface. For example, we can bind acrylic acid, methacrylic acid or HEMA to a surface. This may be a two-step process where the surface is first “activated” with argon plasma, followed by plasma generated in the presence of the desired reactive hydrophilic monomer. The hydrophilic monomer may also be bound to the activated surface using standard polymerization methods. OPRI will naturally undertake research of hybrid polymers that may contain both hydrophilic monomers and reactive hydrolyzable monomers. These polymers will provide improved wetting properties, offer greater comfort and deliver high oxygen permeability for protection of ocular health. OPRI lens polymers consistently work in harmony with technology which is a key requirement. Together with extensive expertise in the manufacture of lenses of complex geometry OPRI stands ready to assist its customers in their design development efforts. With the latest aberrometers, the complete optical system of the eye may be measured. This data can be expressed mathematically and used to design lenses that can correct all physical aberrations of the eye. At OPRI new polymers have been developed to perfect the system. These polymers have the rigidity, permeability and wettability required along with the capability of reducing chromatic aberration. When all aberrations are corrected, or significantly reduced, vision beyond what other current contact lens polymers can offer become a reality.